With some projects, the results are immediately tangible. Take for instance a project where a mudsill is installed to provide cover and habitat for trout. I have observed the trout hiding out in the deep, shady pool under the mud sill the very next day after it was in place. The timeframe for the entire project to install a mudsill from initial project idea through to funding and permitting and finally to construction may take one or two years at the most—and ta da! Instant habitat for the trout! However, such is sadly not the case when the project revolves around restoring streams that are degraded from abandoned coal mine drainage, a pollution legacy that continues to linger from old coal mines where some date back to more than 100 years ago. The color difference between Huling Branch (left) and Twomile Run is noticeable. Nine treatment systems have helped bring Twomile Run back to life. A major reclamation project is ongoing in the Huling Branch watershed. Abandoned coal mine drainage still renders over 13,000 stream miles nearly lifeless throughout the Appalachian coal region, with the highest concentration of more than 5,500 stream miles found in Pennsylvania. The good news is that we are indeed making progress. A recent fish survey by TU biologists confirmed that brook trout have returned to the previously dead, AMD-polluted Twomile Run in the lower watershed of Kettle Creek, Pennsylvania. 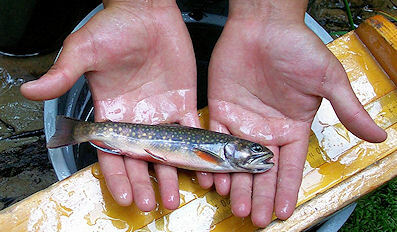 Approximately 40 brook trout were captured with many young-of-the-year and several size classes represented all the way up to about 8 inches. Now that’s exciting! TU has been active in the cleanup of Pennsylvania’s abandoned coal mines, given that over 4,000 of the 5,500 polluted stream miles have the potential to be restored as cold-water trout streams. TU got its start in Pennsylvania on abandoned mine cleanup in 1998 when it launched its third Home Rivers Initiative in the Kettle Creek watershed in north central Pennsylvania. 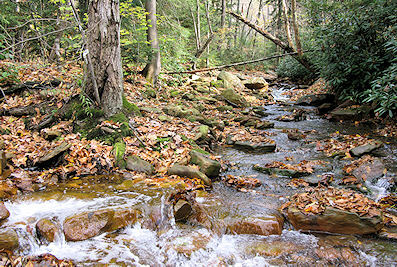 Because habitat degradation from the old days of logging and stream straightening from railroads still impacts brook trout populations, one of the objectives of the Kettle Creek Home Rivers Initiative was to improve fish habitat on streams where water quality is some of the best found anywhere in Pennsylvania. Another primary objective was to restore the lower reaches of the watershed severely impacted by abandoned coal mine drainage. A lot of progress has been made over the years with dozens of fish habitat and streamside planting projects that have a quick turnaround time in providing nearly immediate benefits to both the native brook trout and wild brown trout in the upper and middle Kettle Creek watershed, all to the tune of approximately $2 million federal, state, and philanthropic grants. Pennsylvania’s state fish—the brook trout— is receiving a major helping hand through a cooperative project in Sproul State Forest. However, abandoned mine cleanup requires an entirely different mindset and one has to recognize at the very outset of embarking upon this type of restoration work that it often takes years—maybe even decades—to return a stream back to life. This type of work is also extremely expensive because the assessments to locate the sources of mine drainage (it is not uncommon to not have any record or mapping of old deep mines), characterize the water chemistry that varies with flow and over time, plan and design appropriate treatment and/or reclamation strategies, secure landowner agreements and permits, and eventually construct the projects. There is no single cookbook method to addressing mine drainage and often there are hundreds of individual discharges that must be addressed to positively impact just one mile of stream. I like to remind folks that in the abandoned mine cleanup world, we celebrate restoration successes in feet. Little by little, one at a time, we celebrate each aquatic insect that returns, and each brook trout that makes its way downstream to the newly restored section of stream to claim its new home. So 16 years later, as the result of more than $4 million in grants, nine mine drainage treatment systems, and a land reclamation project, when we reach a milestone of restoring water quality to 3 miles of once-lifeless streams in the lower Kettle Creek watershed where native brook trout can now be found thriving and reproducing, it’s a really big deal! • Worked with ATV groups on riding and mitigation conflicts within the Whiskey Springs ATV Area. These water quality improvements have also reconnected these 3 miles with 3 additional miles of headwater streams (where isolated populations of brook trout existed upstream of the mine drainage) for a total of 6 stream miles that harbor intact, healthy brook trout populations. For anglers who like a challenge and are inclined to weave in and out of the heavy mountain laurel and rhododendron and the occasional old growth hemlocks that line the stream banks, the reward of hooking a beautiful little brookie in a stream that has been brought back from the dead is awesome to reflect upon. The work in the lower Kettle Creek watershed is not yet finished. There are still another 5 miles of streams that remain polluted. We are optimistic that a $12.2 million land reclamation project undertaken by the Pennsylvania Department of Environmental Protection (DEP) will help to address these remaining sources of mine drainage. Although this project is scheduled to be completed in September 2015, we know that it will likely take a few years following revegetation and stabilization of the 100-acre site to result in measurable water quality benefits to the streams and possibly even longer for the brook trout to return. But, what are a few more years? We’ve built up our patience and we’re in it for the long haul because we know this type of restoration is indeed possible! So what may have seemed impossible to some people 16 years ago, we know that without the technical expertise, funding support, and volunteer assistance from our many partners—with special recognition given to the DEP, Department of Conservation and Natural Resources, Office of Surface Mining Reclamation and Enforcement, Foundation for PA Watersheds, National Fish and Wildlife Foundation, Richard King Mellon Foundation, Hedin Environmental, and the Kettle Creek Watershed Association—the brook trout would not be where they are today. Amy Wolfe is the director of Trout Unlimited's Eastern Abandoned Mine Program and the Pennsylvania Eastern Brook Trout Habitat Initiative.